NASA scientists call them “sand dunes.” But in the electrical interpretation, the extraordinary complex of ridges and valleys at the center of Victoria Crater on Mars points back to the same event that produced the crater itself. In a previous picture of the day, we noted that the sharply sculpted “cookie-cutter” form of Victoria crater defies explanation as an impact depression. Taking inspiration from Wallace Thornhill’s insights on the formative process, we suggested that laboratory experiments with short-lived electric arcs (called 'sparks') to an anode (positively charged surface) offer the best explanation for the crater’s distinctly scalloped cliff walls. The advantage of the electrical interpretation is that it also addresses directly the nature of the topography dominating the central area of the crater. 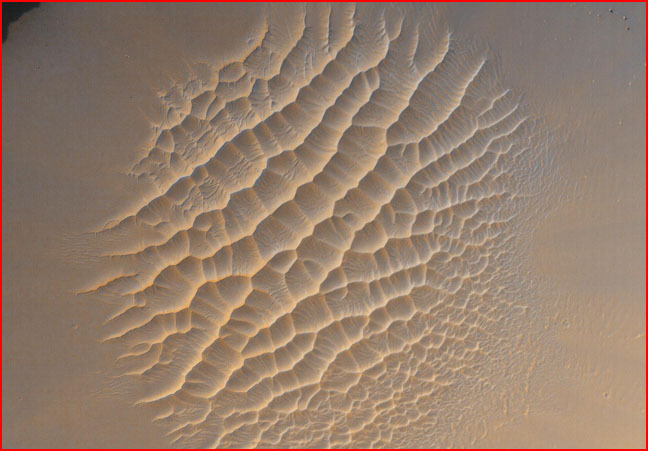 NASA scientists describe this area, seen in the picture above, as “sand dunes,” though the repeated orthogonal configuration – ridges intersecting at roughly right angles -- does not appear to have any precise counterpart amongst Earthly dunes. A possible electric discharge explanation is as follows: Electromagnetic forces between Birkeland currents constrained to a surface will force parallelism. Where a discharge channel branches, the branches tend to run parallel and may rejoin. Orthogonal coronal discharges from the parallel Birkeland currents generate the striking pattern. This model lends itself to laboratory testing. Additionally, the supposed “dunes” remind us of objections to standard theory posed by the electrical theorists: the rarified Martian atmosphere (less than one percent as dense as Earth’s) could not reconfigure the planet’s surface in the profound ways implied by the usual interpretations. The electrical hypothesis emphasizes a testable connection of the orthogonal ridge and valley network to the original crater-forming event. From this vantage point, the test is all too obvious. As noted by Wallace Thornhill, if NASA will examine the ridges on site, they may find that they are “solid, glassified sand, rather like that found in dry soil following a lightning strike.” Notably, the Apollo astronauts observed puzzling orthogonal patterns in the lunar soil and glass in the centers of small craters. That, together with much additional evidence, suggests that the Moon is a heavily electrically cratered body. As we intend to make clear in forthcoming discussions of Martian topography, the ridge and valley patterns on the planet are consistent with electrical patterns on a surface subject to widespread electric discharge activity. In the end, these electrical patterns are sufficient to throw into doubt all conventional treatments of Martian history—even perspectives on present surface activity.